The wiring is too short between the pots so there's not enough slack to pull out any one of them without pulling the whole harness including the output jack. Plus, there are likely tiedowns glued to the underside of the top to keep the wiring from flopping around. Again - the pots are just a suggestion and not a slam-dunk answer. OK, I popped one of the knobs off of my 12014 NS Aristocrat. I think it's safe to assume that they use the same parts in the Aristocrat and Starfire. What I found is that they are metric. The mounting hole in the guitar is big enough to accept a non-metric 3/8 inch pot, but then your knob wouldn't fit. (Metric knurled-split pots have a 6mm shaft with a course knurl. Non-metric pots have a 1/4 inch shaft with a fine knurl.) The point is that you could get CTS pots and install them without modifying the guitar, but then you would need to get different knobs. Guild knobs from the Corona, Westerly, and Hoboken eras would fit, but they might be expensive. Any Gibson knob would fit, but then you wouldn't be able to show your face around here anymore. 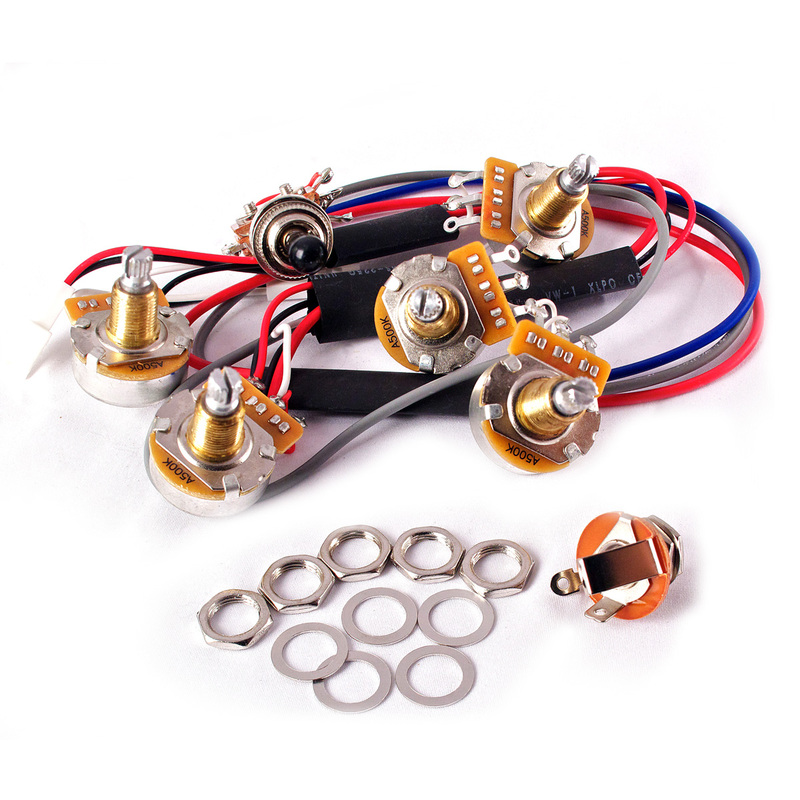 Stew-Mac does sell metric Alpha pots with the course knurl that will fit your existing knobs. Get the 500k, short, knurled-split shaft version. I know for sure that there are ties that keep the wires together. But not sure about the glue. I'm both impressed and dismayed. How would they do that? That's impressive but would obviously make my attempt more difficult. While I would love to own a Gibson (if they can get their crap together!) I did a side by side test between my Korean NS Starfire V and a $4,000 335. I felt the Guild was the better instrument, and didn't have to spend as much. Win Win. But no...no Gibby knobs on my guild. As a side note for Guild Customer service, I emailed them that one of my knobs broke (I over tightened the master volume screw, but they didn't need to know that ) and asked how to get a replacement knob. They sent me one for free and didn't charge shipping. Same thing with my pickup selector switch. Obviously I'm preaching to the choir about how great Guild is. I think I'll probably farm this out to my guy from here. See what he can do or thinks about the pot(s). My understanding is that with the right equipment they can be tested to see what they rate as. I don't have that equipment but he would. So theoretically I could get it checked out before buying something new. That may not be worth it. But if there are parts glued to the top I am concerned I may be in over my head. I don't want to do anything that can't be easily reversed or fixed, and If I damaged the wood then that obviously wouldn't be either. If I end up buying replacement Pots I'll make sure I buy metric. Quality would be the same, just different physical size/measurement, correct? But if there are parts glued to the top I am concerned I may be in over my head. I don't want to do anything that can't be easily reversed or fixed, and If I damaged the wood then that obviously wouldn't be either. It's only the tie mount glued to the top, clip the tie to free up the wires and tie 'em down to the mount again when done. You can see those mounts are even self-adhesive when you pull off the paper on the bottom. Still, getting in there to do it could be more than I'd want to mess with myself, and I actually like to do stuff myself if possible. But I'd still want to have an idea of what "my guy" might be doing. You can see one of them hanging off of the blue wire on the bridge pickup. That one popped off just when I pulled out the pickup - forget about the wiring harness. Also, you can see the quick-disconnects though the bridge pickup route. What's funny about them, at least to me, is that they're so deep into the guitar as to be almost pointless from a repair standpoint, though I'm sure they make assembly easier. Last edited by SFIV1967; 02-12-2019 at 09:54 PM. So. That is all great to know. Thank you so much. I am very new at all of this so I have concerns about diving in too deep, but I am so interested and fascinated by the whole thing. I love it. I've been enjoying my strat, BUT!! these guild guitars are almost like works of art within themselves. Fender guitars are very utilitarian but pretty in their own way. The guild guitars, and other guitars of similar construction, are just so beautiful. I love seeing images of various stages of construction. 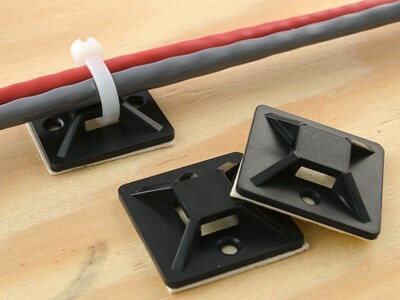 It is good to know that those ties/clamps aren't cemented on there, but can come off easily. I also didn't realize that the quick connects don't go straight into the back of the pickup, they are further down the line. Which means that I may have quick connects. 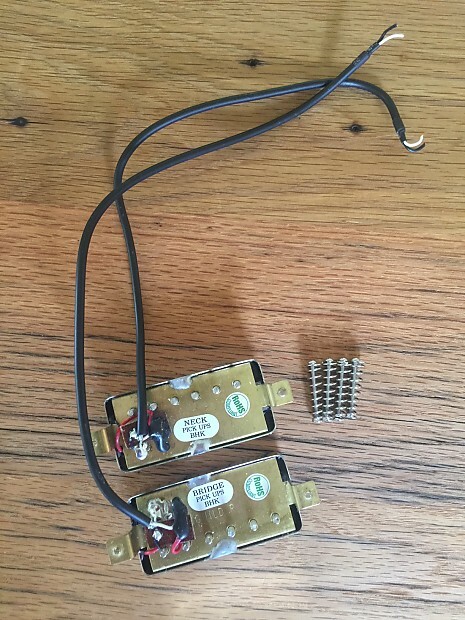 I only took the pickup out of the cavity, and since SFV are semi hollow, I've not seen the entire wiring connection. So...If I find that I do have quick connects I'll let you know. Again, I bought it in Jan '17, so they COULD have made those changes since my guitar was made. But I don't think that is likely. But I'll let you know. I'll be able to play at full volume in a band context this weekend and will let you know how everything sounds with the pickups switched. I'm obviously excited about that. Thanks! I'm interested to hear your report. So...If I find that I do have quick connects I'll let you know. Were the wires red and blue or plain black? Because there was a change from the red and blue wires to simply black wires for instance in the S-200 model. And the black wires have no quick connectors anymore. 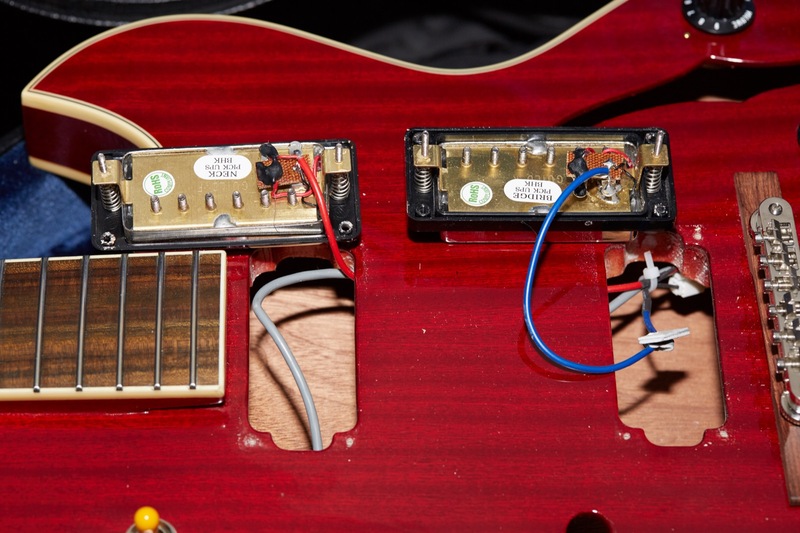 I would assume however the hollow/semi-hollow body guitars still come with blue and red wires and connectors and just the solid body models have black wires. 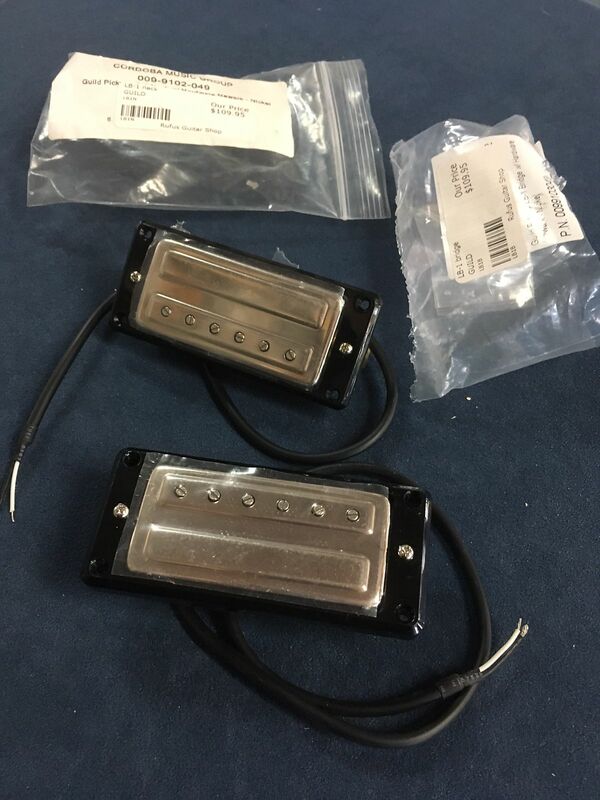 The pickups still come from Booheung Precision Machinery in Korea (BHK). Last edited by SFIV1967; 02-13-2019 at 10:01 PM. My wires were for sure Red and Blue. Which was extremely helpful to me because of my novice-ness. I was able to match up like colors and figured out what was ground vs hot. So definitely colored. Maybe I do have quick connects. Man...wouldn't that have kept the back up my pickup looking pretty. That epoxy likes to smear... Thankfully it also sticks to paper towels. Lol.